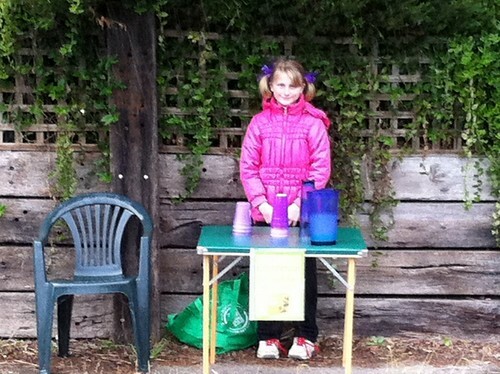 In the rain, in the middle of nowhere, Lilydale VIC, Beccy has a lime cordial stand out the front of our house and made $17.25 in about 1.5 hours. We bought some children’s vitamins recently, just to help the girls along a bit, keep them healthier and hopefully ward away some winter colds and flus. Beccy was up early this morning and she got her vitamin and Lizzie’s out and they both took them. When Bern told me this I was a bit confused. I went and looked at the container, and sure enough, it has a child-proof lid. I asked Beccy how she openend it and she said “I read the instructions on the lid, While Pushing Down Turn” and she showed me that while it took a while she was in fact able to get the bottle open. The scary thing is that I doubt she would have worked it out if it wasn’t written there. Beccy\’s first day at school. She was very excited and up at 6am (1/2 an hour earlier than she needed to be). It was a lovely morning, we went into the classroom, put things in their places and then Bec gave us a hug and said see you later.. Lizzie was the most upset, because she wanted to stay and play with the play-doh. You can click through the image to a gallery of other photos. Bern (to Mark): How do I find who our upper and lower house representatives are? slight pause while I try and remember which department is in charge of elections..
Bec (from the Peanut Gallery): Look it up on a website! As Bernie was driving Beccy to kinder today she told her that we needed to go to the Bank. She said we could go before or after we picked her up and she said to us &quot::Please go before you pick me up, then we can just go straight home from kinder.&quot:: She said ok but then she added &quot::Unless it\’s Westpac&quot:: Bern smiled and told her it was Westpac so she said &quot::Go after Kinder, I want to come!&quot::. Our girls love Westpac because it\’s so child-friendly. They have a great play tent and toys, and when Bec writes out her &quot::deposit&quot:: slip, they also stamp it with children\’s stamps. Thanks Westpac, for making our banking easier! Complete with system unit, screen, mouse and keyboard. She keeps &quot::typing&quot:: messages on it and bringing them down to me and telling me she has an email for me. Bec decided to pack for herself for our weekend away to Mt Beauty. &amp:: 2-3 long sleeve shirts. At least she travels light. Bern and I were talking about a motor type noise next door, and I thought it might be a chainsaw or a circular saw. Bec chimed in that maybe it was a Dinosaur, and I though that was a very funny rhyme, if rather unlikely. When are you going to start listening to me? I so nearly burst out laughing.